Stok Kangri (elevation 6,146 mtr/ 20,162 feet) is the highest mountain in the Stok Range of the Himalayas in the Ladakh region of northwest India. 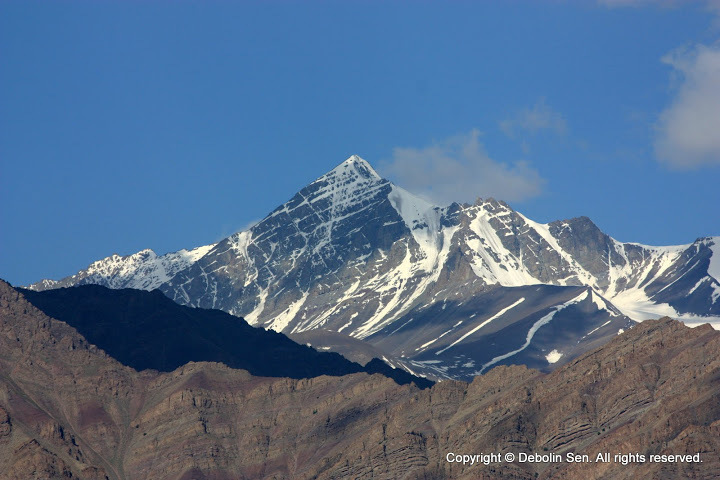 The peak is located in the Hemis National Park, 12 km southwest of the trailhead at 3,610 m (11,845 feet) in the village of Stok and 24 km southwest of Leh, the capital of Ladakh. Despite its altitude, Stok Kangri is a popular peak and is often climbed as an initial non-technical foray into high altitude mountaineering. The ascent of this 6000mtr plus mountain in 10 days is probably the quickest one can climb it, keeping in mind that one needs some time to acclimatize to the altitude as well. After spending the first couple of days acclimatizing in Leh during which time monasteries can also be visited, as also the interesting Leh market, we set off for a week long trek. Instead of approaching the mountain head-on we travel some distance west and then approach it through a slightly longer route crossing the Stok La – a high altitude pass – (4890m/ 16039 ft) and then descending to the Stok valley. This approach gives us a little more time to acclimatize and the steep climb up Stok La acts as a good test before the final ascent. The final climb of Stok Kangri (6146 mtrs/ 20162 ft) will present a challenge to even the fittest. Even after being fully acclimatized, any climb over 6000m will be a tough one. The climb itself is not technically demanding, and on days with good weather conditions, involves going up a steep rocky scree slope and walking over a sharp rocky ridge to reach the snowy summit. Most of the snow on the mountain melts away by early Aug and crampons are rarely used in Aug departures. However with unpredictable weather one cannot rule out a possibility of dealing with some unexpected snow & ice on the mountain. Note: Unless all of us are in good physical shape, which also includes no altitude sickness we will not be able to summit on the long last day to the top and back. Day 06: Mounkarmo to Stok Kangri Base Camp (4975mtrs/ 16318ft) 3 to 4 hrs. Day 07: Getting ready & rest. Day 08: Early climb to Stok Kangri (6146mtrs/ 20162ft) and back to base camp. 12 to 15 hrs. Day 09: Trek to Stok village and drive to Leh. 6 to 7 hrs trek and 1 hr drive. Day 10: Fly to Delhi.